Kalmus Beach Retreat – Come! 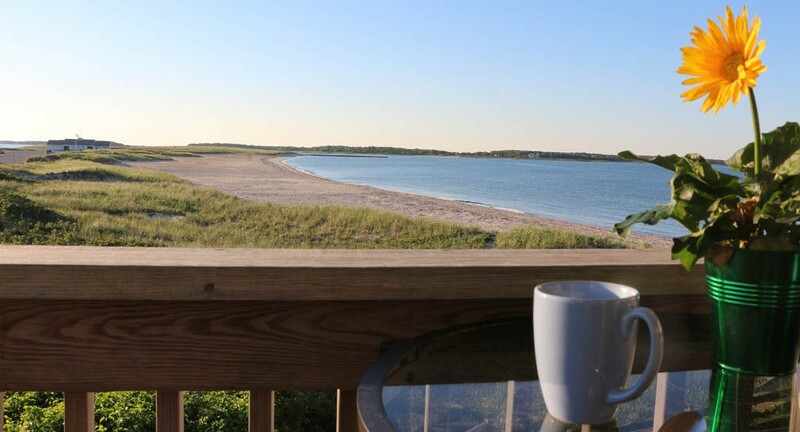 Enjoy the sunrise from your deck in Hyannis, MA. There is nothing like falling asleep to the rhythmic sound of breaking waves and waking to songbirds calling to the rising sun. Morning coffee on the deck offers panoramic views from Kalmus beach to Snow Creek where you can catch a glimpse of cranes and blue huron as well as the pair of osprey that annually return to their nest between the two bodies of water. The Kalmus Beach Retreat is one of the Ocean Gate Condos on Ocean Street, Hyannis. This location is .5 miles from the Nantucket and Martha’s Vineyard ferries and 1 mile to Hyannis Marina, the artists’ shanties, and Hyannis’ Main Streets. Downtown Hyannis offers every imaginable type of food (including homemade ice cream and gelato), craft, and shopping along with the JKF Museum and the Cape Cod Baseball League Museum. Nearby eateries like Spanky’s, Baxter’s and The Black Cat provide great views of the harbor while and Mattakeese Wharf Restaurant provides great views of the bay. Beachcombers may prefer meandering the ~ 1 mile loop from the retreat that provides views of wind surfers and parasailers on Kalmus beach, piping plover hatchlings on the protected sand dunes, people fishing from the rock jetty, ferries entering and leaving Lewis Bay, picnickers at Veterans’ Memorial Park/the JFK Memorial, and homes along Ocean Street. As the ‘big city’ on the cape, Hyannis is home to the Cape Cod Mall, Whole Foods, Trader Joe’s, Starbucks, and other major retail outlets. It also provides easy access to the King’s Highway (Route 6A) art galleries and antique outlets, kayaking and bike trails including Falmouth’s Shining Sea, the Cape Cod Canal Trail and Cape Cod Rail Trail. During the summer, favorite activities include playing a round of mini-golf and watching a Cape Cod League Baseball game. The games are free and the Hyannis Harbor Hawks play at McKeon Park, just off Main St at 195 High School street. Finally, think about coming during one of the many seasonal festivals like the Bourne Scallop Festival, the Heritage Museum and Gardens Hydrangea Festival, the Wareham’s Cranberry Festival and the Wellfleet Oyster Festival. Set up your beach chairs just 30 paces out the front door from this two bedroom, one bath, condominium on KALMUS BEACH. The unit is fully equipped with a galley kitchen (microwave, coffee maker, dishes, utensils, dishwasher, electric range and oven, toaster oven, and full size refrigerator), living room with cable TV and a DVD/VCR player (equipped to access your Netflix and Hulu accounts), free WiFi, and central air conditioning. The newly renovated bathroom has a full size tub with shower. A marble island between the kitchen and living room seats 4-5 and a Bistro table on the deck seats 2. There is also an electric grill on the deck. There is an assortment of fiction and nonfiction books, playing cards, classic family board games, and DVDs. NOTE: More recent releases can easily be found at the Redbox (DVD rental for $1.50) at the Shaws on West Main Street. The unit can sleep 4-6 people. The master bedroom has a new queen size bed and sliders to a deck area looking out to the beach/ocean. The second floor is a bedroom with two single beds. The living room has a queen-sized sleeper sofa. This two bedroom condo is ideal for a couple with one or two children. It is in a smoke free building and the unit does not allow pets. The unit has two reserved parking spaces in the adjacent parking lot. Questions? Email Julie at kalmusbeachtretreat@gmail.com.